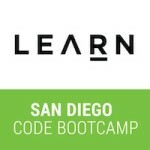 San Diego based LEARN is a hands on, intensive, bootcamp-style course designed to help you transform your interest in programming into a craftsman’s toolbox full of new skills. This challenging course will push you to achieve more than you thought yourself capable of, while providing hands-on access to the skills needed to get a solid start in the rewarding web development career space. You’ll be spending every weekday from 9 to 5 in our classroom learning new programming tools and concepts. Each day builds on the last and you progress at your own pace within a community of like-minded students who are just as motivated as you are. We use daily exercises, landmark skill assessments, industry guest speakers and expert classroom instruction to keep you challenged every day and on track to reach your goals. You’ll pair up with a fellow student to work on the day’s assignment, building your knowledge and skill together. Our classroom instructors will keep you on track, making sure you’re getting the most out of each lesson and the help you need. At LEARN, we learn by doing.